1. 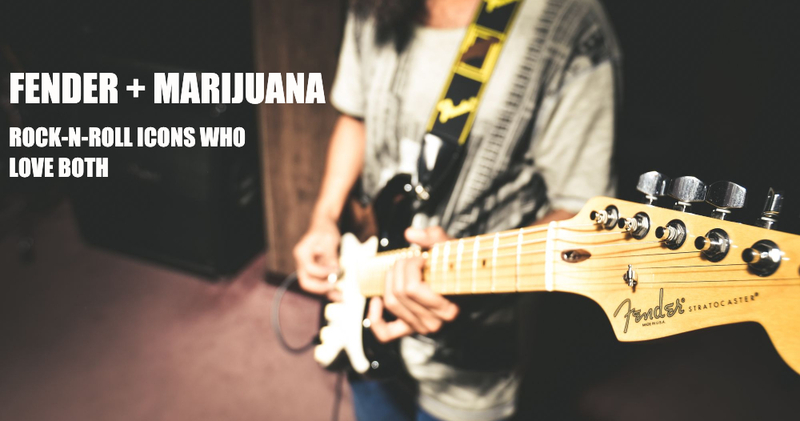 What’s Weed + Fender Guitars + Musicians? Mathematical genius. 2. If you’re a pothead and you can’t stop playing your Fender, does that mean you’re on a Fender bender? 3. Made in Orange County? What’s the Gross Domestic Product? Fender Guitars and Stoner Rock? All jokes aside, there’s something very Orange County about Fender Guitars – possibly because the company was founded here in 1946 by a man named Leo Fender. Inspiring generations of guitarists such as Jimi Hendrix, Kurt Cobain, Poison Ivy of the Cramps, and countless others. His guitars bring a tonal sound to rock unheard of before their introduction during the early Buddy Holly years. Today we’re looking at three local, post-punk, smokin’ hot Orange County guitarists who are high on Fender guitars. 1. Scott Hill, Fu Manchu > Fender Jaguar Orange County band, Fu Manchu is for those who like to rock. Scott Hill’s guitar playing is a force that drives songs into the future with serious torque. Hill plays a custom Fender Jaguar, chosen for its harmonics, and modded for extra sustain. As for high history and the case of Fu Manchu, however, the marijuana influence is mostly in name only. This band can be found in the “Stoner Rock” bin at the record store, but it does not define itself as such and considers the tag a misnomer. 2. Brad Nowell, Sublime > Fender Strat Even though the beloved Long Beach band’s guitarist and leader pretty much only picked up the Fender Strat in the ‘80s, its high tone is prolific in Sublime’s happy sound landscape. A major element of the Orange County punk scene in the early to mid-‘80s and beyond, Sublime would partake of weed just like everyone else. It was a given element, though Brad took imbibing to a heavier place by 1996 and didn’t make it out. RIP. 3. Dexter Holland, The Offspring > Fender Mustang The band that holds the title of highest-selling indie rock album of all time got its start in a garage in Cypress, California. Classic. Music by The Offspring will grab you by the ankles and make you have fun even though you don’t want to because you’re just a pissed off punk at heart. Give in, no one’s watching.